Champagne cocktails are a fun way to celebrate … or just feel like you’re celebrating. The Shrinking Violet gets its delicate flavor and lovely color from crème de violette, a brandy-based liqueur made with violets. The liqueur gives a delicate sweetness and floral aroma to the cocktail, complementing the champagne rather than covering it up. Add a pansy, violet or viola for garnish! 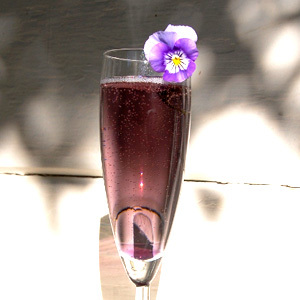 Pour the crème de violette in a champagne flute and top off with sparkling wine. Garnish with an edible flower like pansy, violet, or viola.